Every day, 210 million trips are made across deficient bridges in the largest metropolitan areas, according to civil engineers. Unless Congress acts, federal funding for bridge and road repair will soon run short. Gridlock on Capitol Hill may mean more gridlock for you over the next year if you have to navigate potholes, congested roads, rundown rails or bad bridges. That's because the federal Highway Trust Fund, which helps finance surface transportation projects, will run short of funds as soon as August. If Congress doesn't act, the Department of Transportation might start to delay payments to states. That could result in "an immediate slowdown in highway construction this summer," according to a report from the Committee for a Responsible Federal Budget. Lawmakers' herky-jerky style of financing transportation projects is nothing new. The Highway Fund, which gets its money primarily from the federal gas tax, has been spending more than it takes in for the past decade. So Congress has periodically transferred money from general tax revenue into the fund -- a total of $54 billion so far. It's expected to spend about $15 billion more than it takes in over the next year. And the Congressional Budget Office projects there will be a $167 billion shortfall over the next decade. There's bipartisan support for improving transportation infrastructure since it's good for the economy. Better roads and rails mean less wasted time, safer travels and efficiency for trucks and freight trains delivering vital goods across the country. And infrastructure improvement projects can mean hundreds of thousands of jobs. Lawmakers don't yet agree on how much money is needed or where to find it. Lots of ideas have been thrown around. Among them: stopping mail delivery on Saturdays, boosting user fees and enticing big companies to bring back their foreign profits. Related: Should you pay a higher gas tax? This week, two senators -- Chris Murphy, a Connecticut Democrat, and Bob Corker, a Tennessee Republican -- proposed raising the federal gas tax, which has been at the same level since 1993. But neither Murphy nor Corker are up for re-election until 2018, said Greg Valliere, chief political strategist of Potomac Research Group, in a note Thursday. "If you happen to be up for re-election this fall, there's a very good chance [a gas tax increase] looks like a bad idea." Indeed, there doesn't appear to be sufficient support for any of the proposals. "The most likely outcome will be a short-term funding bill," Valliere said. "But passage of even that modest fix may not come before the August break, jeopardizing many state highway projects." 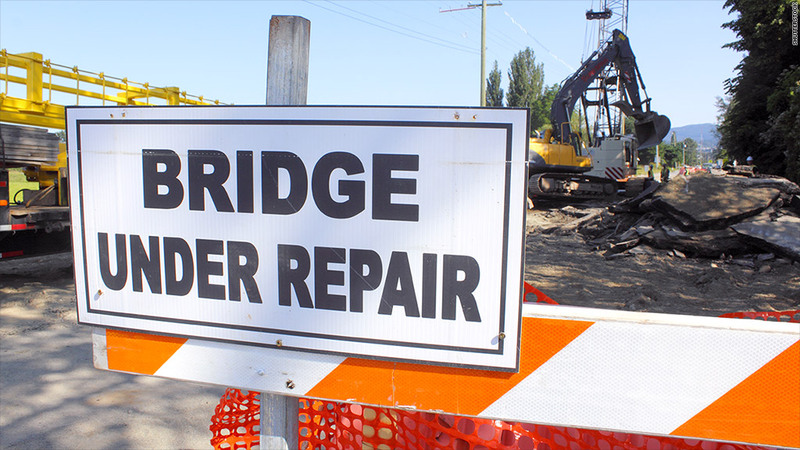 Are your travels stymied by potholes, rundown transit systems, congested roads, or bridges needing repair? Send us a photo via twitpic or Instagram at #mysuckycommute. Or e-mail them to jeanne.sahadi@turner.com. We might include them in an upcoming CNNMoney gallery.